EdReflect offers tools for learners to create goals and track their own improvement targets. The platform permits goals to be tied to specific indicators, allowing learners to develop strategies for improvement. From the dashboard, click the learner whose goals you wish to view. Click View Details on the goal to view the goal details or click the blank Ready to plan your goals? 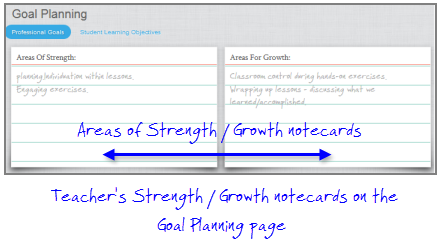 note to see all goals, along with your learner's self-identified strength and growth areas. Starting at either the home page or Goal Planning page, hover on a goal to view its View Details button, and then click the button to view the goal's details. Indicators attached to the goal are listed. Responses to district-defined questions help to clarify how a goal will be achieved. Hover over a recommended goal-related resource to view its details or recommend it to the learner. Progress posts and resources added by the learner to help him/her achieve the goal are displayed at the bottom of the screen. Click a topic or the BloomBoard.com link to open BloomBoard.com, where you can search for professional learning collections organized around problems of practice. Helpful Hint: Observers cannot change a learner's goals. Learners are responsible for writing and modifying their own goals. Learners can create Progress Posts so you can view their updates over time. Observers cannot add Progress Posts, but can view the Learners.